It is dangerous to be child here. In recent years Syrians are engaged in war and crisis. Photos and videos of this horibble situation has been released. Unfortunatly children affected more. No of sharing childhood, no chance to have fantacy. After reading the topic I decided to show childhood subtlety in contrast to children of war’s life. So I used popular cartoon characters. One of the images that has a lot of influce in people and also artists is Aylan death. Combination of gloomy cartoon characters with images of evacuee children try to show the critical situation of children. In process of poster designing I use dusty color to emphasise an unexpected situation. 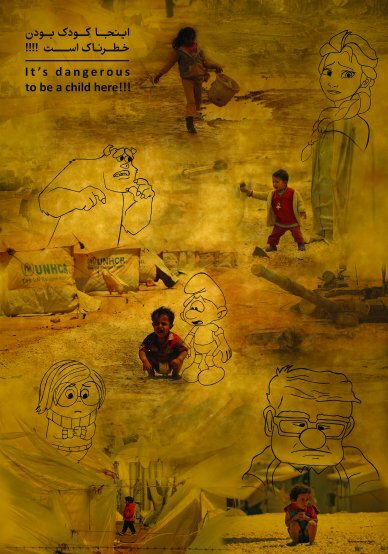 I drew characters on paper than I took photo of them and combine by syrian children images. In the other poster design I use black and white mode to present the dark atmosphere of war. I merged Mickey Mouse by flower in his hand to show his regret of current situation for these children. Overall I would hope to reflect the dangerous situation in syria.